"Tech savvy couple that's ready to simplify and have fun with their environment - young and hip or empty nesters with a new lease on life…Classic white doesn't have to be considered the safe choice. 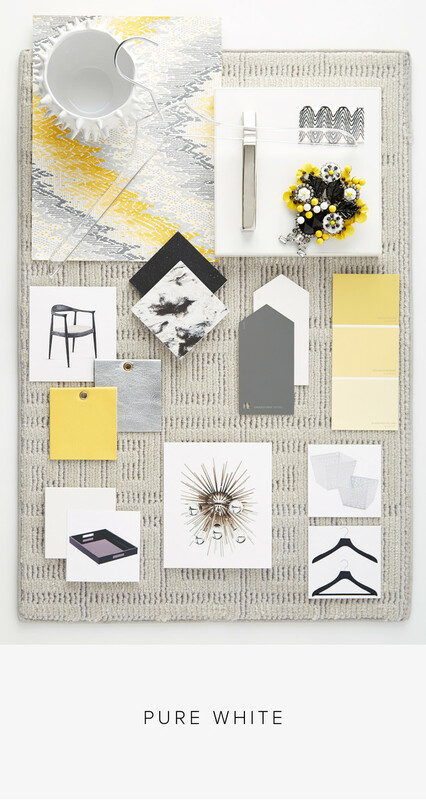 It's clean, fresh and always current; especially mixed with bright yellow and bold black. Metallic leather and black lacquer give a rich pop of personality. 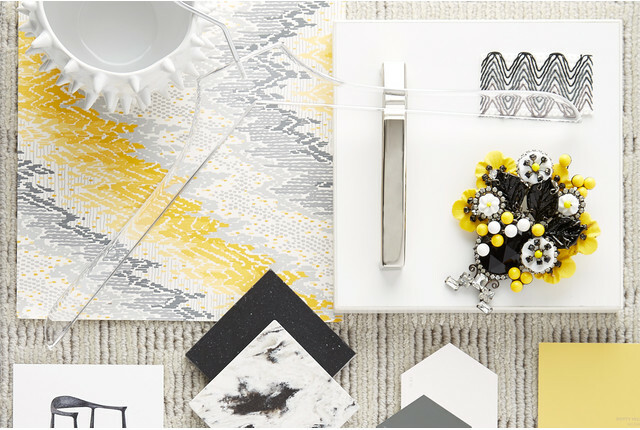 Add large-scale punchy patterns with contrast and you'll have a space that's anything but boring. Sleek chrome hardware and futuristic lighting add punch for the optimistic sophisticate." "World travelers celebrate global influences in their décor. Here we have a romantic mix of materials and artifacts. 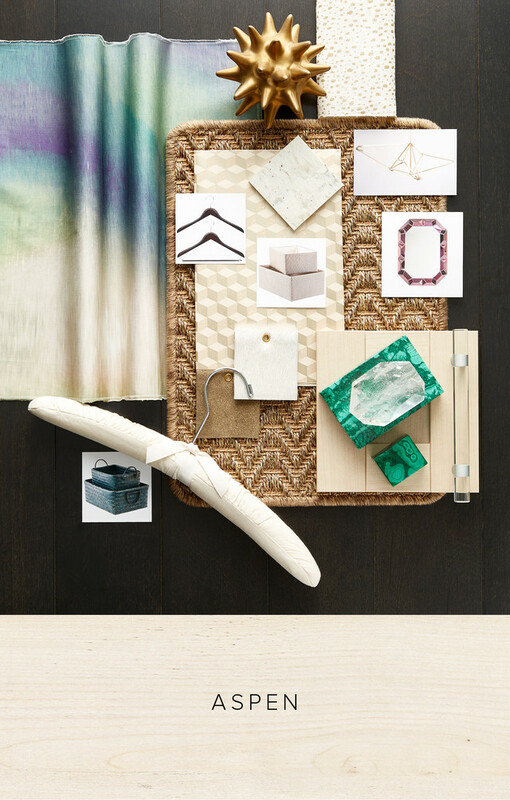 Grass cloth wallpaper, heavy woven baskets, shapely wooden hangers and dark metals layer among rain forest hues. Lizard-skin leather and a velvet of tiger's stripes add a dash of animal magnetism." 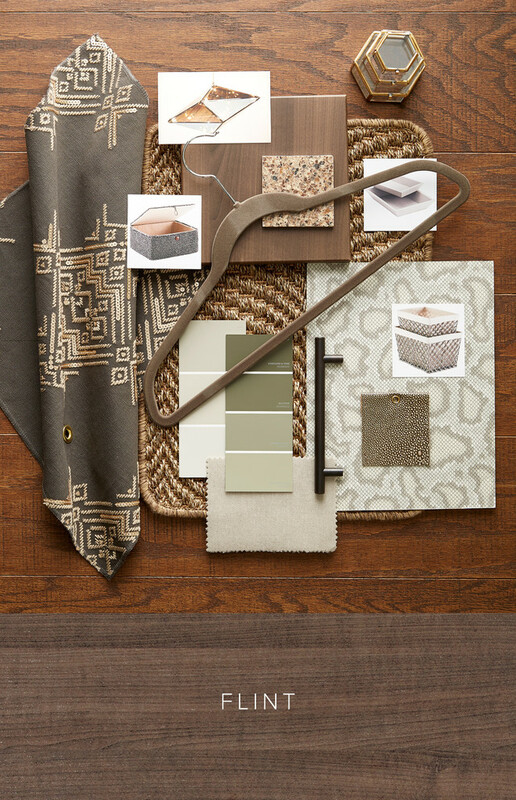 "A Mad Men vibe brings old school study to your personal quarters…Deep chocolate finishes stand on thick wool flooring with a classic Greek Key motif. Cognac partners with royal blue and platinum. Intimate and cozy, a space like this begs you to slow down and take your time. Bronze and blown glass lighting further the relaxing vibe." "Intellectuals with a worldly view enjoy the best of quality with soft earthy colors. Tribal embroidery has a touch of shine- complementing modern lighting by independent Brooklyn artists. 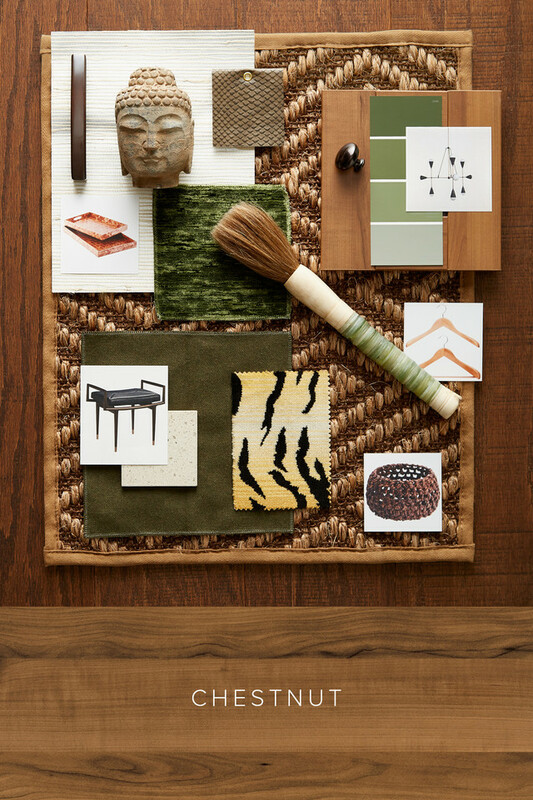 Exotic skins and prints add tropical luxe to rich, moss greens. 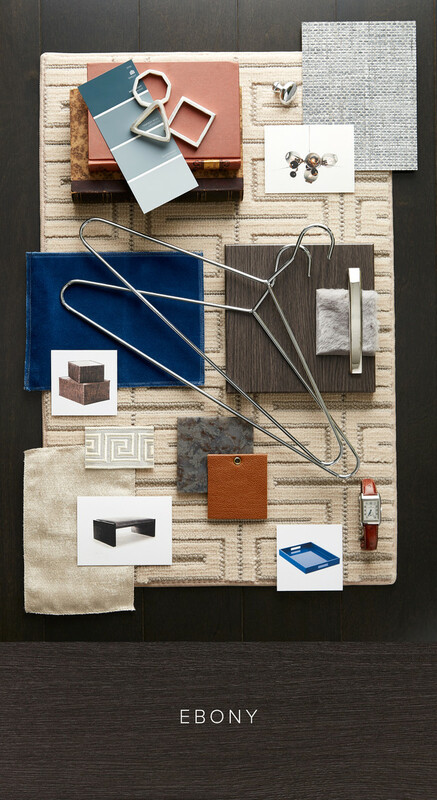 Heavy textures like sisal flooring and jute baskets offset smooth iron hardware and soft suede hangers…Nature becomes nurture in a closet that envelopes the senses." "A strong woman who's confident and self assured, yet ultimately feminine…she appreciates the finer things in life, yet doesn't take it all too seriously…Satin Oak goes glam with rose gold touches that play up its white-washed hue. 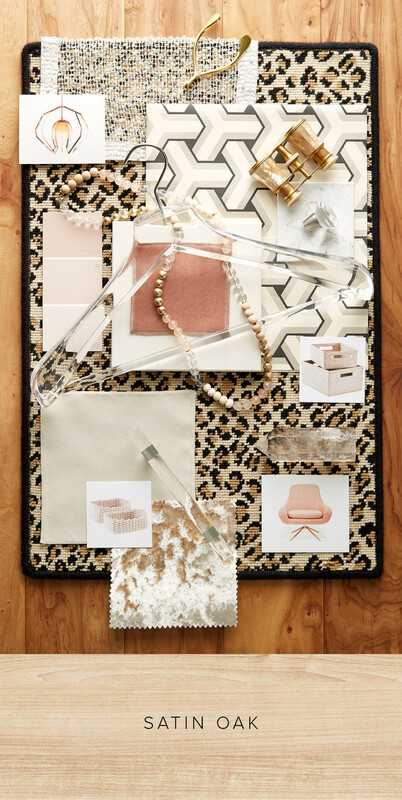 Faceted crystal, sleek glass and chunky acrylic become the jewelry for her home…Classic and lovely, crushed velvet and ivory cashmere partners perfectly with a more playful leopard print and sequined sheers." "Traditional with an edge, this artistic atmosphere showcases emerald and amethyst jewel tones, from the pop-art fabric to the artisan quality baskets. Canvas is splashed with gold and wrapped around padded hangers. Graphic and linear lighting hangs over geometric paper and carved malachite boxes. A refined, yet beautiful, urban vibe." 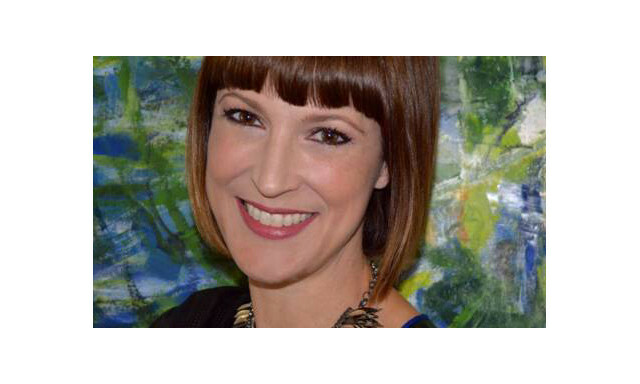 About Shelly: Interior designer and stylist, Shelly Rosenberg is an expert in creating beauty. And as a mother of three, she knows how important it is to create beautiful, organized, spaces. Shelly believes a consciously designed home is foundational for living well, and practices this philosophy with her residential clients throughout the country. Her new website, Shelly Rosenberg Studio, reveals that this self-proclaimed renaissance woman is also a well respected industry insider, collaborating with top-tier designers and writing for numerous regional publications, interior design blogs and digital magazines.